Responding to an audience member question about assault rifles falling into the hands of criminals, Governor Mitt Romney pivoted and connected crime to families: “gosh, to tell our kids that before they have babies, they ought to think about getting married to someone — that’s a great idea because if there’s a two-parent family, the prospect of living in poverty goes down dramatically.” Though they have not generated nearly as much excitement as his now infamous “binders full of women” remark, Romney’s comments which implied that single mothers were to blame for the culture of violence in America ought to outrage us just as much. Such comments are just as revealing of widespread sexism and misogyny in our culture. Many probably laughed at Romney’s tactless single-mothers comment, but evidently there’s something more appealing about attacking “binders full of women” than criticizing mother-blame. In this post, I suggest that mother-blame is so deeply ingrained in our culture, so deeply rooted in our history, that Romney’s criticism of single parenthood simply wasn’t as funny to condemn. By suggesting that the solution to gun violence is to fix the ‘problem’ of single-parent families, Romney effectively blames single mothers for social problems that are beyond their control. We love to blame, distrust, and criticize mothers. Though I am not a mother myself, many of my friends who are mothers have pointed out that if there was anything in motherhood for which they were unprepared it was not late nights and inconsolable babies, but the sudden interest of total strangers in their mothering skills. Having a baby placed them under public scrutiny like never before. Though there is something appealing about the adage “it takes a village to raise a child,” new mothers are not prepared to be asked by complete strangers about when their baby was last fed (“she looks hungry!”) or whether their cranky two-year old has yet had a nap. This kind of judgment does not only happen in supermarkets and on streetcars. The media has found it fitting to put the spotlight on Yahoo C.E.O. Marissa Mayer’s decision to take a very short maternity leave, her decision to use a photograph of herself without a “baby bump” for a magazine cover, and her decision to ask her twitter followers to help her choose a name for her baby. Though the discussions about Marissa Mayer tend to centre on today’s career women and whether they can “have it all,” the historical roots of these modern examples demonstrate that there is more to these debates than a contemplation of work-life balance among modern day career women. 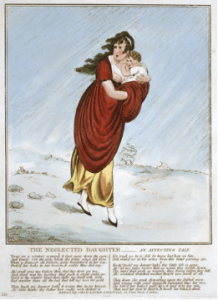 History can reveal much about the ways the idea of the “bad mother” is deployed in the media and in presidential debates, and it can help us better understand mothers’ experience with strangers in the supermarket. But let me mention another thing, and that is parents. We need moms and dads helping raise kids. Wherever possible, the — the benefit of having two parents in the home — and that’s not always possible. A lot of great single moms, single dads. But gosh, to tell our kids that before they have babies, they ought to think about getting married to someone — that’s a great idea because if there’s a two-parent family, the prospect of living in poverty goes down dramatically. The opportunities that the child will — will be able to achieve increase dramatically. So we can make changes in the way our culture works to help bring people away from violence and give them opportunity and bring them in the American system. Romney’s gender-neutral language shouldn’t fool us. ‘Single parent’ almost always means ‘single mother.’ According to the U.S. Census Bureau, of the 12.9 million one-parent families in the U.S. in 2006, 10.4 million were single-mother families and 2.5 million were single-father families. So, when we suggest that a social problem (in this case, gun violence) could be solved by solving the ‘problem’ of “single-parent families,” we really are suggesting that single mothers are to blame for the problem in the first place. More importantly, the idea that women “getting married to someone” before having babies is a better solution than gun legislation (Romney said, “Yeah, I — I’m not in favor of new pieces of legislation on — on guns and — and taking guns away or — or making certain guns illegal”) is outrageous. Even so, such reasoning has a long history. Romney’s comments echo ideas raised in the infant welfare campaign of the early-twentieth century. As Katherine Arnup shows, the war waged on infant mortality in Canada was a war waged on working-class mothers. Though most reformers recognized that poverty, inadequate housing and malnutrition were main causes of infant mortality, it was maternal employment and breastfeeding that were targeted. Arnup shows that, rather than push for child-care services, higher wages, shorter hours, or maternity leaves for working-class mothers, infant welfare reformers focused their energies on telling women to breastfeed and to avoid working outside the home. By focusing on breastfeeding and women’s work, the blame for high infant mortality was placed firmly on mothers, rather than on the more-difficult-to-solve problem of poverty and its consequences. As historians of motherhood have shown, mother-blame has always held more force when it zeroes in on single, poor, ethnic or black mothers – in short, mothers who are already disproportionately disadvantaged in other ways. In the U.S., though nearly 69 percent of all children live with two parents, the story is different among minority groups. For example, over 50 percent of black children live with their mother only, compared to 3.5 percent that live with their father only, or 37.7 percent who live with both parents. Romney was right to suggest that poverty was a problem among single-parent families and that violence is more prevalent among groups that suffer from poverty and lack of opportunity. But he does not propose policies that would help lift families out of poverty. It is much easier to blame single, poor mothers for being single and poor. Such an approach to the question allows Romney to ignore the crux of the issue. It also permits Romney to turn a problem about young men’s culture of violence into a problem we can blame on women. So, why are we more apt to criticize “binders full of women”? Because it is not just policymakers, reformers and politicians that like to blame mothers for social problems. Our culture of mother-blame and the long history of our suspicion of single mothers make it easier for us to accept Romney’s bad-mother line of reasoning than to accept his jumbled understanding of pay equity. Of course, our society doesn’t just blame mothers; we praise and glorify motherhood too. But the glorification of motherhood has its consequences; one of them is that we tend to place so much emphasis on the importance and value of good mothering (often defined in very conservative, middle-class, heterosexist, and racist ways) that we allow ourselves to blame mothers when things go wrong, even when the problem is entirely out of their control. We need to begin thinking about motherhood in more realistic ways, in ways more grounded in the material realities that shape family life and constrict women’s choices. Perhaps then we might be able to move beyond blame to envision policy alternatives that tackle the problems of poverty and lack of opportunity. I am currently researching the ways in which late-medieval discourses equated “mothering” with “healing”. Healing, not just in the (modern) medical sense of curing an ailment but, rather, in a more holistic sense – maintaining the health of the mind, body, and soul. After spending weeks and months in the Middle Ages it is exciting (and disturbing) to hear echoes of this discourse in the present day.